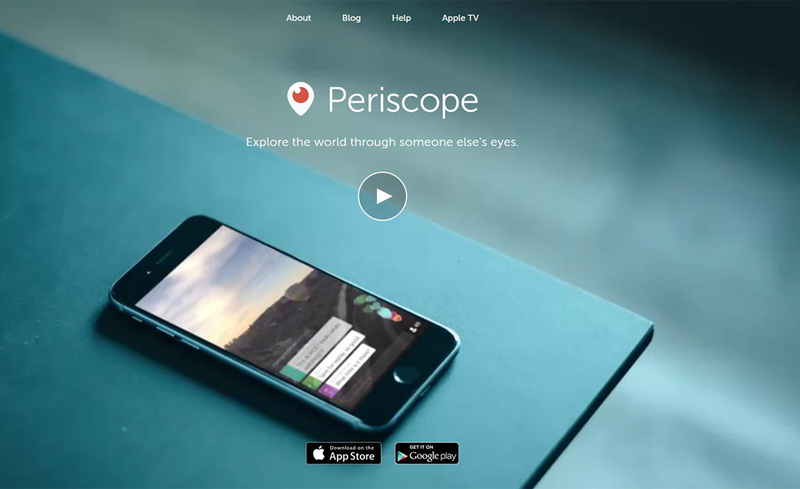 New Mexico News Port used live streaming apps like Periscope to produce talk show-style interviews. 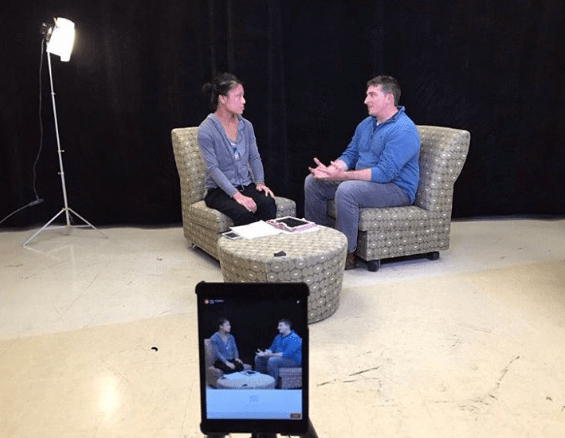 The recent explosion in popularity for live streaming video means more newsrooms and journalism classrooms are looking for better ways to integrate real-time broadcasting into their online reporting. With a little planning and practice, getting set up to go live can be a rewarding experience for journalists and journalism students who want to tell video stories on the go. So far, apps like Periscope largely have been used to broadcast events like rallies, speeches or concerts. But there are ways to bring the immediacy of live streaming to other non-breaking news events, like interviews. "The students were excited to experiment with a new way to reach our audience through Twitter followers and Periscope users, as well as on Facebook." At the student journalism lab New Mexico News Port, we decided this semester to try to live stream a series of TV-talk-show-style interviews from campus. As we planned for the series, we first considered shows that would feature our guests being interviewed as they walked through campus while live on air. That idea didn’t last very long, given our windy weather, boisterous middle-of-the-city location and bright Southwestern sun. (Think noisy audio and squinting guests — not to mention trying to figure out how not to trip over each other as one of us walked backwards as we filmed). So we settled on a studio in our Communication and Journalism building, although the setup we used could be deployed in a variety of locations. Early on, we considered using the Blab app as our platform. But it seemed more suitable for people in various locations and too much like a Google Hangout for the style of show we were hoping to achieve. In the end, we chose Periscope, in part because it works with Twitter, where we have a decent-sized audience. By comparison, building an audience on Blab seemed like more work. Our goal was to use mobile equipment — in our case, an oldish iPad mini we already had — and to try to get the quality of the broadcast to be as high as possible. In the end, we produced four live shows using Periscope and one with Facebook Live. The students were excited to experiment with a new way to reach our audience through Twitter followers and Periscope users, as well as on Facebook. The students are walking away from the semester with the expertise to set up and run their own shows. 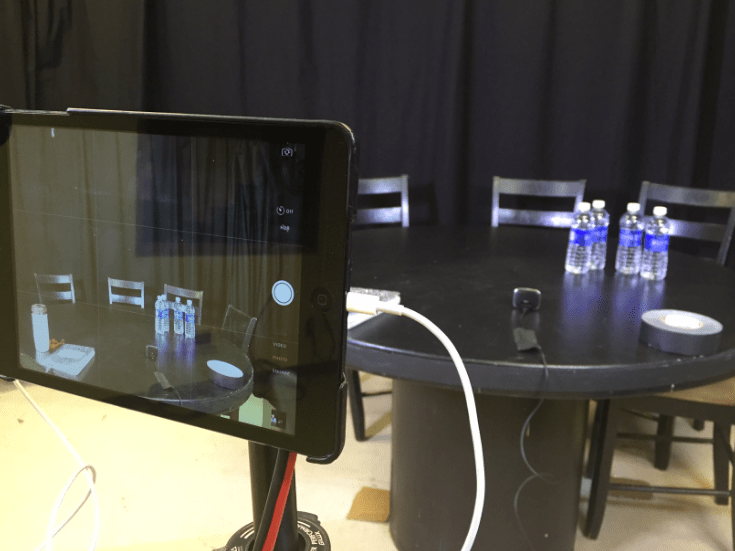 An iPad set up in a studio with one mic and minimal lighting was all it took a group of students with the New Mexico News Port to start a live broadcast from the campus of the University of New Mexico. Photo by Kate Nash Cunningham. Here’s a look at what we learned, along with the pros and cons of the equipment we used. Going live is the selling point when it comes to using a mobile setup. The fact that Periscope and an iPad can stream live to Twitter (no satellite truck or website required) make up for the fact that the image and audio quality aren’t yet on par with more traditional broadcast equipment. The beauty of the mobile setup is its price. For this project, we spent about $115 on a microphone and its cable. We used lights that are built into our studio, but you could do a cheap lighting setup or use natural light, depending on the situation. We had an iPad mini 2 ($270 or so when they were new) and a $13 case that mounts the iPad on a tripod. The Periscope app — which is tightly connected to Twitter — is free. The student who ran the camera for the show had been introduced to the iPad and Periscope just days before. With simple explanations of iOS and Periscope, he did fine. Many students and journalists have smartphones and tablets in their purses and backpacks. Adding a tripod and a case increases a journalist’s load slightly, but is not as cumbersome as large video cameras or even DSLRs. Students hanging around our news lab were curious what we were doing with the iPad on the tripod. We also found that the small and familiar nature of an iPhone or iPad wasn’t overly intimidating to our show guests because the equipment is so commonplace. The set up needed to broadcast live is relatively simple and affordable. Pictured are a Mikey microphone, an iPad mini and power cords. Photo by Kate Nash Cunningham. On-board audio quality is low. Many of us have watched Periscope broadcasts where it’s hard to hear/understand what’s happening. But for less than $100, you can get an external mic for your iPhone or iPad. I recommend getting one like the Mikey. I have played with low-end external mics for the iPad mini and haven’t been impressed. The Mikey did well during our tests and our show. It has three settings, a simple interface, and can be set on or taped to a table. We also experimented with taping it to a boom hooked on to a light stand, which was O.K. except that in order to get it close enough to all our guests, it showed up in the frame. Depending on your setup, and your ability to hold the boom just out of the frame, a boom might be a good way to go. If you go with an external mic, be sure to get a six-foot cord that’s going to allow you to put your mic close to the person speaking. We taped ours to the table, just out of frame. We tested our studio lighting setup extensively with the stock iPad photo/video app. Because of the ability to control for focus and exposure, we had our video looking sharp and well lit. That wasn’t the case when we went into Periscope to test the live stream. The auto-focusing and exposure were thrown off by the studio lighting against a black backdrop and the image quality was terrible. This quality issue was the only thing that caused me to panic ahead of the first show. In the end, we used studio lights (dialed down a bit from our tests to provide less contrast) together with the overhead lights. This boosted the image quality and helped the camera with its focusing and exposure. 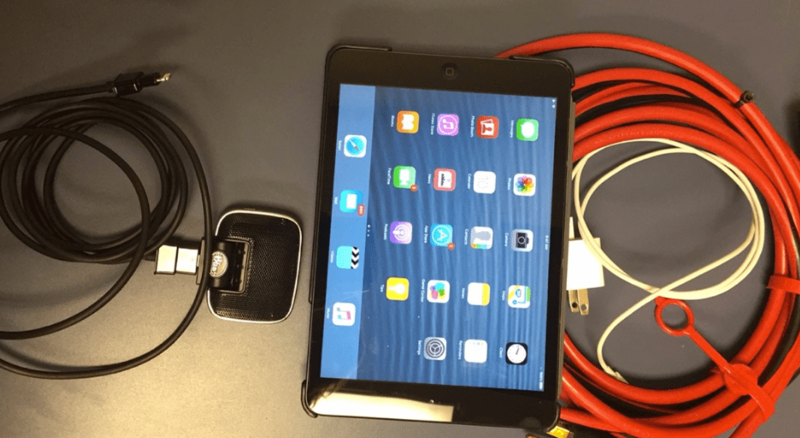 Knowing that live streaming video eats batteries, I made sure to leave home the day of the first show with the wall charger for the iPad, and I had already set aside an extension cord in the studio so that the iPad could run on power from the outlet. I even had a backup portable battery charger, just in case. My plan was foiled when I remembered that the Mikey uses the same (and only) lightning connection on the iPad. I was forced to chose between good audio and a shorter show. I chose the good audio. And because our live show turned out to be less than 20 minutes, our battery life was fine. But streaming anything longer could prove problematic. Periscope lacks the ability to add graphics or titles as is done in a more traditional broadcast setup. We thought about name tags or signs for our guests, but in the end we decided if the show went long, that we would pause and just reintroduce them. The ability to add names to the screen was one thing we liked about the Blab app. One of the great things about Periscope is that viewers can send their questions or comments live through a chat function. This works well when you’ve got the phone or tablet in selfie mode and can see the screen up close. But for a setup in a studio, it gets tricky. The show hosts can’t see the questions, so it takes someone to keep track of the questions and then get them to the host in near real-time. In our case, we used text messages to convey the audience questions. It was a bit strange to have students look at their phones during the live interviews, but the audience engagement was worth it. New Mexico News Port intern Angela Shen interviews Elan Collelo about virtual reality during a show on April 20, 2016. Photo by Kate Nash Cunningham. By the end of the semester, Facebook Live was becoming a thing. So for our last show, students used it instead of Periscope. Overall, we used the same technical setup in the studio, although we found a stash of casual chairs and went for a “living room” effect for this particular show. Getting set up with the Live section of Facebook was a breeze for students, who seemed to know that they create a new post first, and then click the icon for live streaming, which is a person with radio wave-esque lines around their head. We wrote a post describing the show and were rolling. In terms of glitches, the Facebook app crashed on us twice during the show (and our mic came untaped from the table and went sliding through the bottom of the shot.) The app crash gave me time to tape the mic again, but made for an interesting few minutes as I wondered whether I should walk into the shot to fix the mic. Because we had students in another room monitoring the audio who said it still sounded ok, we opted to leave it. To interact with the audience, we worked to get people to write comments on our Facebook post with the stream, but we didn’t have the same luck we had when engaging the audience with Periscope. I think with time and promotion, we could build a following for the show on Facebook, as well. Students plan to try another series of shows about the election in the fall. Kate Nash Cunningham teaches journalism at the University of New Mexico and is the editor of New Mexico News Port, a collaborative student journalism lab. Follow her @katenashnm.